martial arts classes for adults, children, families. Near you and near me. Looking for Martial Arts classes near you? The Martial Art of Tae Kwon-Do (known to some as Korean Karate) first arrived in North Devon in 1992 under the affiliation of the TAGB (Tae Kwon-Do Association of Great Britain), Europe’s largest single TaeKwonDo association with over 20,000 members in 500 clubs Nationwide. The TAGB is recognised by the British Tae Kwon-Do council and the Governments ‘Sports England’ ensuring professional and safe tuition. Get fit. Gain confidence. Learn self defence. 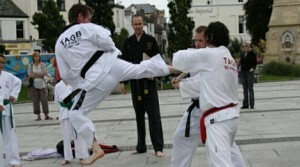 North Devon TKD has evolved into an extremly popular family club. You can train alongside your children making it a great way to encourage them, and yourself (!) to develop an active and fulfilled lifestyle. We have a great social side to our club too. We have regular nights out for the adults and some brilliant fun activities for our younger members. All thanks to our team of dedicated and passionate instructors. 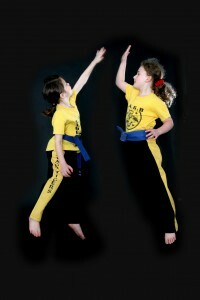 North Devon TKD martial arts classes; firm, fair and fun! Our training can be hard (we won’t apologise for that! ), at times technical and methodical, but never boring or overbearing. We believe in teaching a worthwhile life skill, helping you with your physical and mental wellbeing while having great fun. Because we are a Martial Arts Club rather than a business then we are able to offer you and your family a whole month of free taster sessions! So go on, go for it, it’s free! Our Martial Arts classes are held in Barnstaple, Northam, Bideford, Landkey and South Molton under the instruction of our dedicated team of qualified and experienced instructors and overseen by Paul Harris 5th Dan Black Belt. Mr Harris has been running the classes since 2003. In that time North Devon TKD has produced National Champions on competition circuits and many Black Belts to the highest standard. The TAGB host regional, national and international competitions on a regular basis along with seminars taken by international Martial Artists. This gives members an ideal opportunity to train with top Martial Artists from all over the world. As a member you’ll be able to attend these events enjoying entertaining days out whilst witnessing the skills you will be learning. North Devon TKD caters for all ages, the young to the young at heart. TaeKwonDo is not about simply kicking and punching or aggression, it is however about focus, learning and bettering yourself. For the younger members we encourage life skills, working alongside peers, learning street awareness, simple self defence and having fun! For us adults; self confidence, raising self esteem, weight loss, fitness and learning an effective way to defend ourselves and our loved ones. We have to give credit to the parents of our younger students. After witnessing the positive effects TKD has had on their childrens health and wellbeing, many begin to learn TKD themselves. With the correct attitude to learning, TKD is suitable for all ages and abilities including Special Needs. Further information on our Safe Guarding Policy can be seen here. 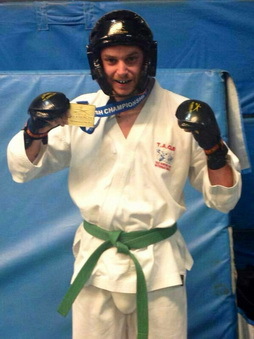 North Devon Tae Kwon Do is for everyone. We look forward to the future and the new people we meet along the way. North Devon TKD has a wide choice of venues to train in over a small area, ensuring that every student can get maximum tuition in a friendly and safe environment with minimal travelling. We don’t believe in minimum term contracts so you will not be tied in to any costly period. We do however believe that you will want to come training with us as often as you can. So we operate simple monthly membership options that allow you to train at as many of our classes as you wish. We even offer a family discount where every additional family member from the same household pays HALF PRICE! What have you achieved recently that makes you feel proud? Get in touch with us then come along and give it a try for FREE.